A Message from the Man Himself, Santa! I can’t believe we’re back again at Enniscorthy Castle getting ready to create yet another magical experience for all you boys and girls. It feels like only yesterday Mrs. Claus and myself were busy keeping Smelfie and his merry crew on track as he guided you all through the enchanted castle tour. 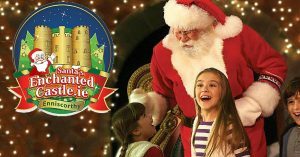 Word in the North Pole is that Santa’s Enchanted Castle is Wexford’s favourite Santa Experience now. 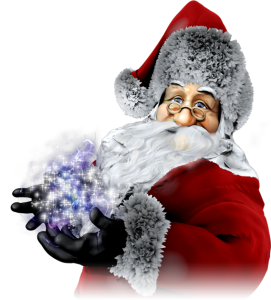 My merry team are busy once again preparing for our 2018 visit to Santa’s Enchanted Castle in county Wexford, the elves are so excited – I’ve never seen them work harder! As usual, there will be so much to see and do throughout the tour which will be lead by none other than Smelfie the Elf. Smelfie has gathered his circle of friends to join in the fun including his favourite Disney characters, Paw Patrol, Trolls and more. A truly magical experience awaits the whole family as each of our enchanted rooms will be decorated and themed uniquely such as our Ice Age room and Beauty & the Beast room. Mrs. Claus is working closely with The Wilds, Enniscorthy to whip up some delicious festive snacks to go with your tea/coffee as well as organising her favourite sweet treats for the children before they come see me. I’m just bursting with excitement to see you all once again (it could just be all those mince pies I ate on duty on December 25th). I’ve programmed my Magic Selfie Mirror to check for all the naughty and nice boys and girls as well as installing my Christmas-Cam to take a festive family photo you’ll treasure forever. My Sensitive Santa Experience is available again this year on special dates. These quieter tours with a maximum of 8 children per tour, are specially designed for children with autism and other sensory, physical and developmental needs. Gentle characters, a trained SNA and private visit with me , Santa, means children are supported and will grow in confidence throughout the tour. My office elf hasn’t been seen since the 28th August since we went live with our ticket sales. If I were you, I’d get booking to make sure you get your preferred tour date and time. Tickets are selling out faster than Rudolph’s personal best and we don’t want anybody to be disappointed come Christmas. Why not make your visit extra special and turn it into a family Christmas break with one of our partner hotels – Treacys Hotel or the Riverside Park Hotel? They have prepared some great value packages which include breakfast, Santa’s Enchanted Castle tickets and my personal favourite, a hot chocolate on arrival. OH! Look at the time, I should be updating my list with the names of all the boys and girls who have already booked in. I can’t believe we’ve already reached 50% capacity. I best get going before Mrs. Claus finds me. I really can’t wait to see you all – especially all our new babies who are experiencing their very first Christmas, my elves have put together an extra special present for all new babies to remember their first Santa experience by. Bye bye for now and remember, my elves are always watching so be sure to be on your best behaviour!